After my recent project was radically downgraded I have decided to take a second look at grades. Obviously bouldering is ridiculously subjective as conditions and height can play a massive role in altering one's perceptions. But there are other subjective factors that cannot be ignored such as tradition, reputation of an area, and reputation of a climber that cause people to accept a consensus. I based my grade of There Will be Blood on my perceptions of two local problems that are similar in style and which I did recently. These are 606 in Eldorado Canyon which has long been regarded as solid V10 and the Left Graham Arete which also has been graded V11 very consistently. 606 took me about 6 tries in a couple of hours while LGA took a few sessions and maybe 10 tries over all. So I was baffled to see grades like V10 for TWBB from the low start, which took me well over two weeks to complete the whole version, and have a couple of ideas. One is that height played a huge role on two moves that I found particularly hard. Moving to the crimp I found I had to keep my feet low and really stretch for the hold, meaning that taller climbers would easily do the move without feeling crunched and then not be so extended for the throw to the lip. The other possibility, and this may be way off base, is that the key crimp was exfoliating allowing better purchase for later ascents. Each dyno for the lip pulled it out a bit more, making it better, until finally it snapped. The sad part about Flagstaff is that holds are fragile and violent moves on flakes tend to break them. My sequence was much more static and I believe much harder, but also more likely to extend the life of the now-departed crimp. The new hold is far, far smaller than it was and while the problem might still go, the remaining flake, if not handled with great care, will quickly disintegrate to nothing. 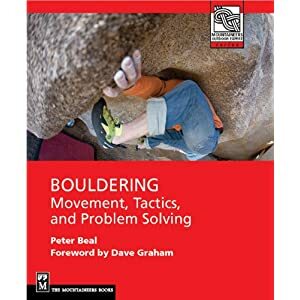 In any event, when putting up new problems in a hypercompetitive scene like Boulder you always run a risk of seeming too ambitious or even pretentious in giving problems a grade. I try to seriously compare my experiences at other areas and on other problems before I make a decision to rate a problem. I want to thank the people that wrote their comments on this blog in a spirit of understanding and generosity. I appreciate it. I discovered this afternoon that I may have dropped a shoe each from a pair of lace-up Dragons and V10s (old style). The V10s have the initial "PB. "Each shoe is a right shoe so they are of limited/no use to the finder. If you have any ideas on where they might be, please contact me as soon as you can. They likely fell out of a pad on the section of trail below and just east of Cloudshadow. The big ABS competition was last weekend and while I didn't go, neither, it appears, did any of the local media outlets. There was nothing in the Boulder paper, except a picture of a climber at Flagstaff, who was described as being in town for the competition. As far as I can tell, the Denver Post ignored it altogether, as did the TV stations. So the question has to be asked, will this ever change? I want to propose that it will not and here's a start towards explaining why. This comes from someone who has seen climbing media change from black-and-white grainy images in obscure magazines to almost real-time HD video. I have seen it all and follow it all still, even after 30 years. Doesn't matter--for the non-climber, it's like watching paint dry. If you aren't at least somewhat interested in the specific route/problem/area, outside climbing videos lose interest rapidly. Comp climbing footage is even worse. Sure you can build bigger dynos or wacky positions into the problems but then it becomes something else, like comparing the Harlem Globetrotters to proper NBA basketball. If you don't know exactly what's involved, it doesn't matter how hard the climb is; you can't tell what matters or why. A 5.9 climber shaking up a jugfest looks as impressive as a 14d climber on the latest testpiece. Try explaining to a non-climber what exactly is difficult about hard climbing. And don't even get started with scoring systems. According to one ABS climber, he was penalized for trying and failing on a problem while a tied fellow competitor came "ahead" after not trying the problem at all. Which leads to point 3. I read yesterday of a 13-year old doing a 14d. Maybe in women's gymnastics, owing primarily to the scoring system, do we see such achievement at such a young age. But the truth is that climbing is almost unique among athletic activities in allowing such young climbers such high standards. Talent and genetics pays off very quickly in climbing, far more than anything else, allowing the youngest climbers rapid access to an elite level. But besides their parents, nobody is going to pay to see a 13-year old do something that is boring and confusing. By that I mean that the playing field is tiny, comparable maybe to chess or ping-pong, maybe far less if you consider the square surface of a crimper or sloper that could determine success. In big sports, players move around a lot and quickly and do stuff across that space. Even gymnastics is bigger. With climbing you never can tell what's going on from a distance, which prevents mass audiences from vicarious participation, even if wasn't boring or confusing. Even arm-wrestling and poker can be comprehended by comparison. Of course it is but I mean in a way that matters to the non-climber. The game itself does not allow real competition between teams or personalities in a way that non-climbers can understand. The challenge of climbing something does not make sense anyway (see point 2) and therefore the potential for vicarious participation is utterly lacking. Anyone can jump on a skateboard or play football. But you actually have to do quite a bit of climbing to really understand the difference between 5.7 and 5.14 and unfortunately (see point 3) the ease of climbing makes the "difference" increasingly hard to see over time. I'd be interested to hear from others about this, especially as more climbers seek to become "professional climbers." Who or what can support these individuals and what is the future of selling the sport to the public? In other words, it's not just how the marketing is done but the "product" itself that is proving resistant to commodification at the truly commercial level. I don't see it changing anytime soon. 1. How long are you in Font? What's the weather been like? 2. What attracts you to Fontainebleau besides the climbing? 3. How should a visiting climber from the US prepare for the climbing in Font? Work on your footwork. Climb slopers; worse slopers than you think. Slabs, too. Core tension, but not the type for roofs, is really important. For climbing, you really just have to jump in and be willing to get schooled, pretty hard and for awhile. Prepare to climb as hard as you can at a noticeably lower grade level, which in Font means even less than you've ever known. I've done v9's here that are DEFINITELY harder than any v11s anywhere, Font included. There are v5s I may never climb! It helps to learn a little french, like for beta and directions. Many people appreciate the attempt! Other than that, bring some books to read, movie to watch, and a rain jacket. And chalk. Most chalk here is pretty bad or expensive..
4. What makes a classic boulder problem for you? A line, like a feature. Not so much a line of holds up a wall, though there are many that are just that I appreciate, too. It's a shifting thing, a sliding scale, I guess. Setting. A feature like an arete, or prow, or a beautiful tombstone of a slab, or an amazing dyno from perfect holds on an overhang in the mountains.. I guess a lot of things make a classic boulder problem for me, but I favor compression aretes on slopers with awful feet, anywhere from below vertical to well overhung. 5. Any planned projects at home in Colorado? Thanks a bunch Chris! Make sure to visit his website--good video, photos and writing. Jerry Moffat, who is marketing his new autobiography, Revelations, has a very good interview at Planet Mountain. It probably gives the clearest picture around of what hard climbing meant in the 1980s and early 1990s. Things have certainly changed since then and great respect is owed climbers who, like Jerry, set appallingly high standards without gear and attitudes that are considered essential today. Here is a short and not very exciting video showing the training exercises I do, outside of bouldering, to develop core and finger strength. I typically warmup with some time on an elliptical trainer and doing some pushups, situps, and free weight stuff such as bicep curls. I will always do rotator cuff strengtheners as well. This takes between ten and fifteen minutes. Then I take about five minutes to do some deadhangs and a few easy pullip sets, typically five reps each. The rest is on the video. I will usually take 30 to 45 minutes overall to complete the workout which I find is enough to get me feeling reasonably sore that day and the next. The key in bouldering is to have finger strength linked with a good core and shoulder area, allowing you to extend your contact strength in any direction and hold it. My biggest weaknesses are working across large spans and long dynos and I will be working on how to improve in those areas. This past Thursday, I squeezed in a couple of hours to finish off the sitdown start to the problem I did earlier called There Will Be Blood. This involves a long reach to a very thin crimp and a move left to the starting holds, where a very difficult match leads into the previous V10. It took a few tries on what was probably the tenth session of working on this problem. The sky was gray and there was plenty of snow from the day before but things were reasonably dry. I was very happy to stick the final slap at the lip. Given my experience on other area V12s, I decided to give it that rating and not V11. Obviously time will tell but I feel honestly that it is another level beyond a problem such as the Left Graham Arete and very similar to Clear Blue Sky in style. It reminds me a bit of European Human Being as well. The first took me just a few days to do last fall and I am confident that if the latter two were as accessible as TWBB, they would be done in similar time. In any event, I am on to new projects both at Flagstaff and elsewhere. I was surprised to see that 8a.nu picked up my scorecard as a news item and am pleased that they published a revised version of "Climbing Past 40," previously seen at frontrangebouldering.com. The video of the problem is below. I am really pleased to present a short interview with Chris Danielson, a true climbing professional. These interviews will be an ongoing feature of Mountains and Water, all in an effort to present a broad range of the personalities and characters that make up the climbing world. Thanks a bunch Chris! 1. What's your job and how did you get into the climbing industry? I work independently as the National Climbing Wall Representative for various handhold and gear brands. I represent the climbing brands in the Great Trango Holdings family - e-Grips, PMI, Flashed, and Trango - as well as two other top handhold companies, So iLL, and Teknik. My other full-time job is that I work as an independent consultant to climbing walls. I started my consultation work, Thread Climbing, a few years ago, assisting climbing wall businesses in their start-up and providing direction to help businesses operate professionally, efficiently, and successfully. This work branched off from my long-term experience as a routesetter at various top gyms, work building climbing walls about a decade ago, years in competition organization and routesetting with USA Climbing, and perhaps as much or more from my academic experience and passion for research. 2. What are you doing for the upcoming ABS nationals? I am one of a team of routesetters for the Adult Nationals event. This event has become the premier bouldering competition in the country, and I have been proud to be a part of it for many years. Our team is a collection of some of the most experienced competition routesetters over the past decade - Scott Mechler, Kynan Waggoner, Jamie Emerson, and the strong younger guy in the crew - Kyle McCabe. We basically spend a long week trying to create spectacular movement that will also do the incredibly challenging job of fairly dividing the field of competitors. 3. What do you think makes for a great comp problem? 4. Any advice for those aspiring to be professional routesetters? Don't be inspired by the amount of money you may or may not ever make, but at bottom, be inspired by the creative process and take the work seriously as a way to introduce climbing to new people, motivate climbers, and challenge yourself. A career as a professional routesetter is hard to come by, and even harder on the body. It's physically and mentally draining. But there is nothing else like creating climbing movement the way routesetters do, it's an amazingly, singular unique activity. Someone once said, I can't recall who - what we need are more climbing professionals, not more professional climbers. I guess I'd say we could use more of both, but the more professional you take your work and passion, the more successful you'll be. 5. 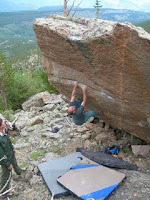 What's your view of how the recession is affecting the climbing industry? An economic downturn hits everyone in some way, but I think certain categories of the climbing marketplace are affected greater than others. Perhaps retailers and manufacturers will get hit a bit in 2009, or, just as likely, as in other industries, this will simply be a strong wake up call to find ways to operate more efficiently, which may mean even if business is down, the bottom line may not be affected as much. Also, while to many climbing is simply a recreational activity among others, to those of us for which it is a passion, we may just redirect our spending. Rather than take a long trip this year, I imagine people may frequent their home areas more often and spend more time in the gym, which bodes well for gym owners and perhaps even local shops. People may save money on gas, but will buy plywood, handholds and some climbing videos, and train hard, getting that much more motivated to go to some new climbing destination when they have more confidence in their spending. Or, as is commonly said - the most serious climbers will go without food before climbing, and in their own way, may inspire others, with that fervent passion for the sport. Thanks again for your help Chris and good luck with the Nationals this weekend! If you or someone you know would like to be part of the Five Questions Series, contact me at petergbeal at hotmail dot com. My friends at Climbing Magazine distributed the Golden Piton Awards at the OR show last week and I will say that I agree with their picks. Each winner was clearly, except perhaps in Alpinism, ahead of the rest. But I want to suggest, from a visual and environmental and symbolic angle to rethink the award itself. It's tiny, you can't wave it around, and it represents an unsustainable climbing technology. Its phallic penetrating qualities are another story altogether. Suggestions on a way to rethink it? Regarding the "profession" of climbing, read Carlo Traversi's blog. In it he describes pretty accurately the situation of the "sponsored" climber. However only time will tell if such forthright,and undiplomatic descriptions of the way things are in the industry will help his cause. At a time when the economy is in free-fall, the amount of support available to help climbers is sure to dwindle and I predict very rapidly dry up in the coming months. This may even extend to the traditional "mom and dad" sponsorship that most "professional" climbers have had to rely on for real financial support as opposed to a free pair of shoes. If you are an up-and-coming "professional climber" and want to be sponsored by Mountains and Water, drop me a line and we can discuss terms. As for me, I labor away in obscurity, finding some satisfaction on standing on top of a rusty brown pinnacle on Flagstaff Mountain, warming up for my next project in the 45 degree weather, with only an hour of climbing time before class, watching the low gray clouds dropping snow onto the plains of East Boulder County. As I mentioned before, I transferred this blog to its own domain, mountainsandwater.com. In the coming weeks and months I will be creating more original content, including more opinion essays on important topics as well as interviews with individuals I think are important in the climbing community. Recently I have been hard pressed to find the time to produce the kind of writing and commentary I would like to see on this blog. In the near future I will be focusing on the quality of writing and not so much on climbing news except where it's truly exceptional. I feel it is time to begin transforming this space from an opportunity for occasional ramblings to a more serious forum for thinking about the meaning of moving in the vertical environment. As always I welcome your suggestions and comments. Mirando from Jon McCartie on Vimeo. Here's a short video of a problem I did Saturday called Face with No Name, considered V6 with the big ledge, V9 without it. It's a great crimp problem. The same day I did Face Out V5 (even in running shoes!) and First Overhang V5, two of the best problems on the mountain.